Product Dimensions: 56" x 26"
If you need slightly larger rugs for your fireplace hearth or other rooms in your home, this oversized rug should fit the bill. Available in half round or rectangle shapes, they are slightly larger than those offered in our Contemporary series. The neutral colors with wide borders, such as this berry color, will complement any decor, whether contemporary or traditional. Made of the highest quality 100% virgin wool, they are flame retardant as well, to protect your floors from sparks. Suitable to use anywhere in your home, they make a cozy spot for pets to sleep! Try using one in the kitchen or bath. How would this material react to a burning ember dropping on it? Would it singe or melt in any way? The material on this rug will be singed if a hot enough embers makes contact with it. However, the material is designed and treated to minimize damage and to not allow the damage to the effected fibers to spread to adjacent fibers. Does this rug need a non-slip pad underneath it? If used on a wood floor, it would be prudent to use a non-slip pad beneath the rug. Tile or carpet surfaces will not require a non-slip pad, as the rug is thick enough to stay in position on these surfaces. Beautiful rug and color is gorgeous. We love the thickness and size was perfect. ProsSimply beautiful and color is great along with size. More carpet beyond the hearth than any other rug I've seen. Looks great too! Great product and great quality. Extremely fast shipping. We received our hearth rug and found the quality to be great! However, the color we had expected was not what we got. It was called "dusk" and the rug was lavendar in the center with a "dusk" color in the border. It unfortunately did not go with with our decor. We contacted customer service at efireplace and Chris was a great help. He contacted the manufacturer who had the original package with the rug picked up at our home and our credit card was refunded the full price. One of my biggest pet peeves with hearth rugs is when they slide around when you walk on them (that's just dangerous) and when the corners eventually permanently stick up (which looks absolutely horrible). This rug has neither of those problems, and looks very good as well. It has done a great job protecting my flooring. I think that the picture doesn't really do justice to the actual quality of the rug. When I got it my first thought was that I should have had to spend way more money to get a rug that is as thick and well-designed as this one. 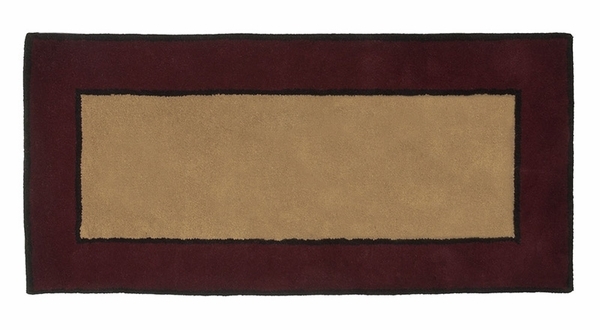 Finally, a good hearth rug that isn't decorated in some sort of overly tacky woodsy manner. You can't beat that for this price.